And, I have very broad interests, because of this I am easily (very easily) distracted, and can spend hours thinking about or researching (the internet can really be a curse) something completely irrelevant that I will forget about almost as soon as I have learned it. 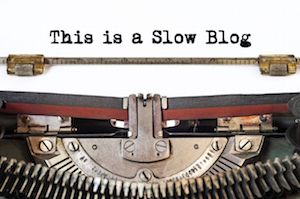 Which is not really the “Slow Way” (or if you are trying to sound all pretentious, you could be all faux Eastern, mystic and say the “Tao of Slow…”). In fact, one of the things that first attracted me to the Slow movement and the Idle philosophy was the idea that I could reduce my field of interest. It showed me that I don’t need to know, do or try everything. That I am not really missing out on something if I am not at the forefront of it, if I don’t know everything about it with five minutes. But how do you practically stop yourself from doing this? How do you start to cut back on your fields of interest, of reducing your desire (addiction?) to the new, the fresh, the exciting, the smell of the grass over the fence? How do you start limiting yourself? Ironically, I started limiting myself many years ago, before I had even heard of the Slow movement or before I even realised that I really, really needed to. When I was at school I was told I was “word blind” (whatever that is?) and that I wouldn’t able to read very well (nothing like a nice positive suggestion is there?? ), so I hated reading, I was slow and it would take me weeks to read something that other people would read in a day. Anyway, to cut a long story short, when I left school and thought “Stuff ’em, if I want to read, I will read!” and started devouring books (I was – and still am – a slow reader, but at least I was motivated to try and read). I fell in love with books, but soon found that (because I read slowly), if I just rushed to read a book just for the sake of reading that book, I wouldn’t retain any information and it was a pointless waste of time. I realised I was probably not going to be able to read every book I wanted (or felt I should) and that I needed some form of plan. Number one on the list was Gulliver’s Travels. Number two was anything by Stephen King. Since getting into Slow and embracing its philosophy I have expanded this idea to write a ‘NOT To Do List’, things I never intend to do. Ever. So when I decided to develop my NOT to do list that went straight at number one. Number Two was backpacking (or “travelling” if you are more of a pretentious ilk). For years I felt like I had missed out on something because I didn’t go travelling when I was younger (it was besides the point I didn’t fancy the idea of cheap flights and fleapit hostels), and always thought I should do it. Once I added those two to the list I felt an immense sense of relief. I managed to shrug off 2 massive hang-ups that I had. Then I was on a role! (Not that I am saying you shouldn’t be doing those, I am just using them as an illustration of things I have added to my not to do list and why. You may love extreme sports and backpacking. In which case, go for your like!). Recently I have added Internet Forums to the list (I just can’t cope with all the bickering) and I am seriously thinking about adding Twitter. I don’t get it and I can’t be bothered and it stresses me out because I feel I should be on twitter (because everyone else is, right? See, how this works?). Tim Ferriss calls this “selective ignorance”, he uses it mainly in the context of information overload and doesn’t read papers and only checks his email once a week (I am still developing my slow email strategy – I will write about it once I have it sorted-ish). How Do You Start Your ‘NOT To Do’ List? Easy. But it does take a bit soul searching and discipline; you have to be honest with yourself. I highly recommend you treat your ‘Not To Do’ list in the exactly the same way as a ‘To Do’ list: Write it down. Not on a scrap of paper, but in a decent notebook (so you won’t lose it). I also add a date and a reason why (some things I have added to my list I have come back to years later and can’t remember why I added them in the first place). So, what do you put your list? Then start listing things you are doing now just for the sake of. You probably have lots of habits that have just developed over the years that no longer really have any reasonable function, you just do them because you have always done them. Not sure if it should be on the list? Put it on for a week and see if you miss it, if you last a week, leave it there for a month, if after a month you still haven’t needed to do or missed it, put it on forever. You see, the idea of a good ‘NOT To Do’ list, is to start cutting back on what you are doing now as well as resolving not to do new (irrelevant) things.